Back in early 2017 when ESPN’s massive round of layoffs changed the course of the company, one of the departments hit hardest was baseball coverage. Not only was longtime MLB writer and analyst Jayson Stark let go but Baseball Tonight, once a daily standard on ESPN was relegated to being a weekly program. Instead of leaning on original programming on their own, ESPN decided to announce that MLB Network’s Intentional Talk would be joining the channel’s daily schedule from 4 p.m. to 5 p.m. ET on ESPN 2, one hour before the show then airs on MLB Network. Hosted by Chris Rose and Kevin Millar, the show had built a following based on its many segments and fun banter, giving ESPN a baseball-centric program it could point to in spite of the changes. 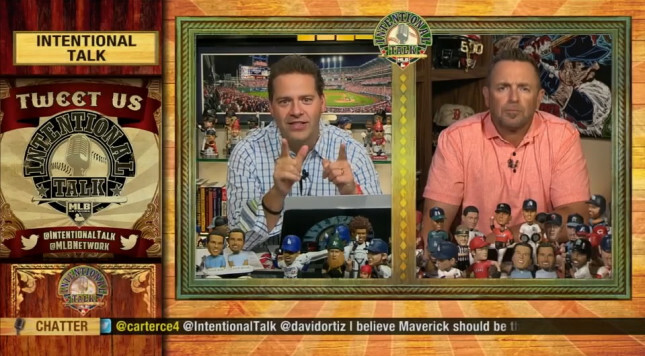 The deal for Intentional Talk was for two years, culminating in April 2019. However, there were major rumblings a month ago that ESPN had decided it wanted to reverse course and bring back a daily in-house show. At the very least, the indication that Intentional Talk’s time with ESPN was running short proved true as the NY Post’s Andrew Marchand is reporting that Intentional Talk is no longer on ESPN2, though it will continue to broadcast on MLB Network as it always has. As for the presumed return of an in-house daily show, however, that remains to be seen. Marchand says that he’s been told the new baseball show is “likely be a nighttime program and not for the afternoon slot vacated by Intentional Talk.” However, he did note that Baseball Tonight would return in some form at the MLB winter meetings in Vegas next week. ESPN2 will feature multiple programs from the event, including some in Intentional Talk’s old timeslot. However, reruns of College Football Live and High Noon will fill that space after the meetings for the foreseeable future. As for why ESPN might want to bring back its own in-house baseball show so soon after jettisoning its old one, our own Andrew Bucholz noted how new head honcho James Pitaro is known as more of a baseball fan than his predecessor. Also, it could be a strategic move in order to make ESPN more attractive when TV rights for the MLB Playoffs come up again in 2021. The current MLB TV deals run through the 2021 season, so a change isn’t imminent, but contract talks are likely to start soon if they’re not already underway. And while there’s a lot that goes into contract negotiations, and the existence or lack thereof of a studio show is far from the most vital element, a regular studio show can be seen by leagues as evidence of a commitment to the sport, and can help boost a network’s case. Until then, if you want your Intentional Talk, you’ll just have to head to MLB Network to find it.